In the top right corner, between your Active Tag and the ? Help link will be your Welcome Drop-Down. Your first name will display, along with the picture that is on your profile record. This menu contains several options. This is a direct link to your people record. 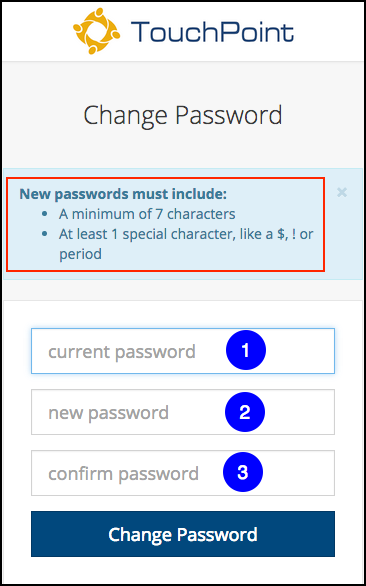 Then press the Change Password button. You can set your preference for this. The default is for it to be turned on (button/toggle is green). When it is turned on, clicking a link to view a person’s record will open that record in a new tab in your browser, leaving your original page available on the original tab. This feature is in effect for people lists in Search Builder results, People Search / Find, Tags, Organization people lists, and names in the Birthdays list on your Home Page. This works like the Open Person in New Tab. The default is for it to be turned on (button/toggle is green). When it is set to on, clicking a link on an organization will open that org in a new tab in your browser, leaving your original page available on the original tab. 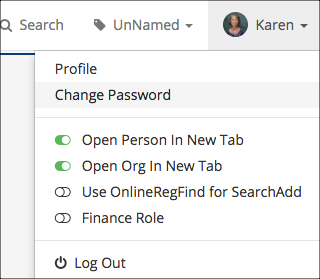 This feature is in effect in Organizations > Search Manage, and also when viewing orgs in a Pick List. If you turn this toggle on, the form that it used when searching and adding (such as adding Member to an Organization) will be the one used during online registrations. The normal Search/Add allows you to enter partial information, such as part of a first or last name. The Online Reg Find requires that you enter a complete first and last name. Also, if a child is registering and you use an email address that is on the record of another family member, but not on that child, it will still consider it a match. We do not recommend that you keep this toggle turned on. It is merely a way for you to easily see how the Online Registration Find page works. If you have both Admin and Finance roles, or Finance and Finance Admin roles you have an option under the Welcome Menu that allows you to turn off the Finance role. This comes in handy when you are showing your screen to other users for demonstration purposes, or if you are working in a more public location, and do not need Contributions / Finance features. For this toggle, when it is green the finance role is on. Click the toggle to turn off finance features. Just click to log out of TouchPoint. If you close the tab on your browser on which you are viewing TouchPoint (instead of logging out) and then reopen TouchPoint within the time allotted for an ‘active session’, you will not be required to log back in. However, if you log out, you will always have to log back in.